Happy Halloween! 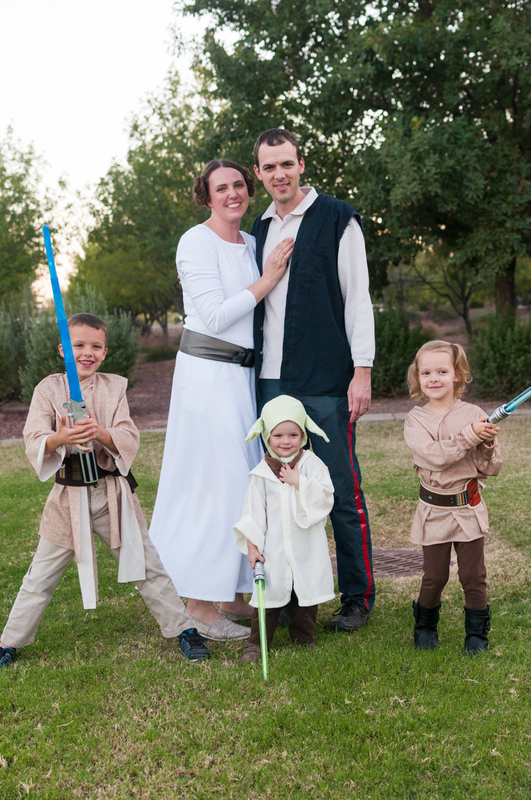 This year we did a Star Wars Theme for our Halloween costumes. I know, I know, so did EVERYONE else it feels like. But this was the year we showed the movies to our kids, and they are OBSESSED. So, Star Wars it was. We purposely chose to do the old-school version of Star Wars: the new movie is awesome but not super kid-friendly for littles (about half-way thought, with my six-year-old hiding under the blanket, I realized it was PG-13. Oops!) So we abandoned Rey and BB-8 for the old school version we know and love. 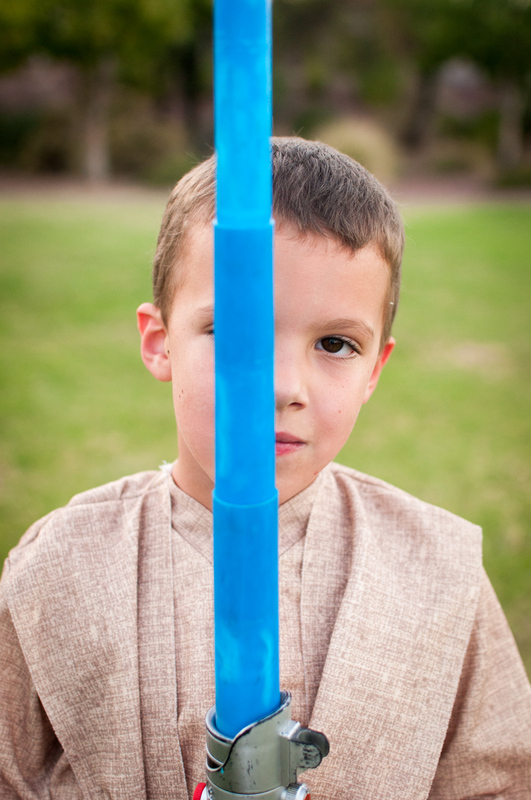 We’ve got two Jedi here. 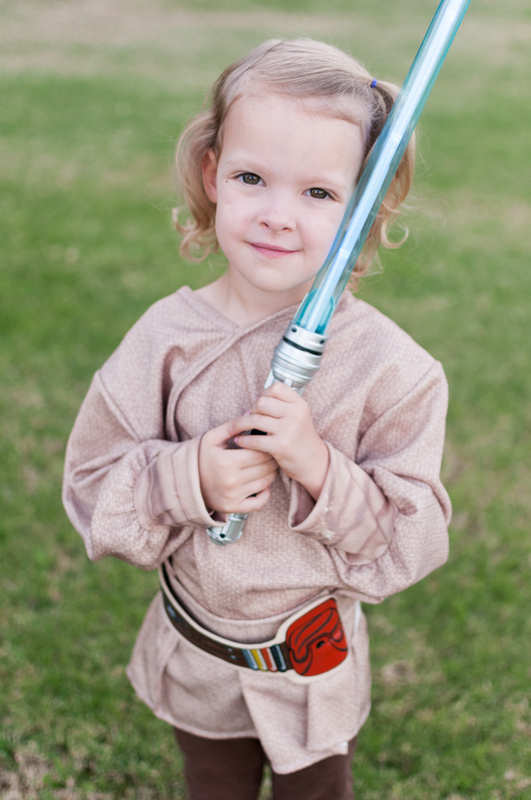 I originally had one as Luke and and one as Obi Wan, but then they fought over who was who, and I settle for both being generic Jedi. 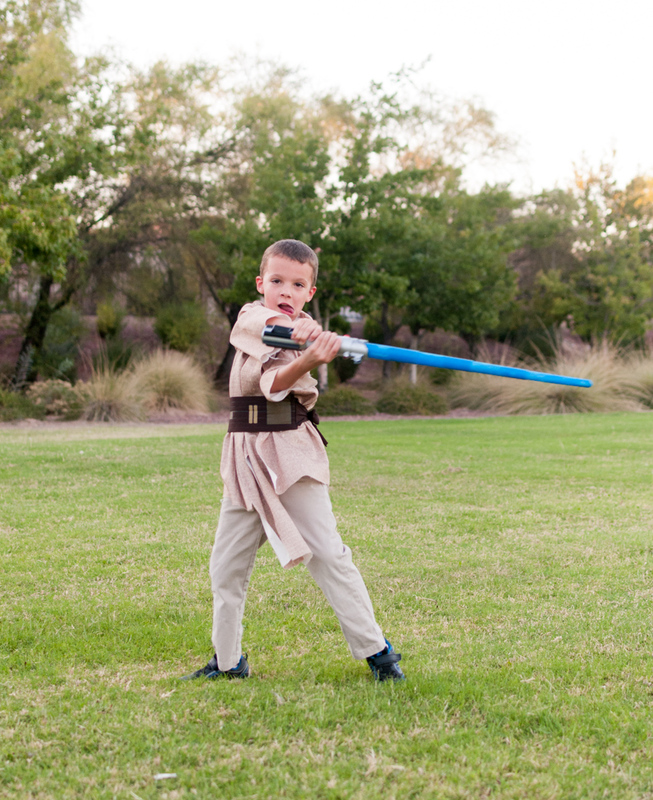 As long as they got a light saber, both were ok with that. 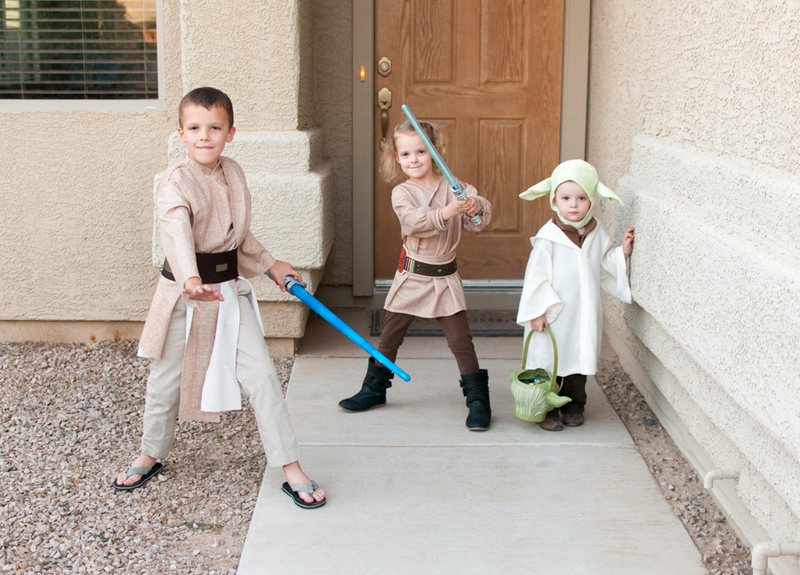 We did store-bought and borrowed costumes for the kids… I’m totally capable of sewing them, but I just wasn’t in the mood this year for DIY! 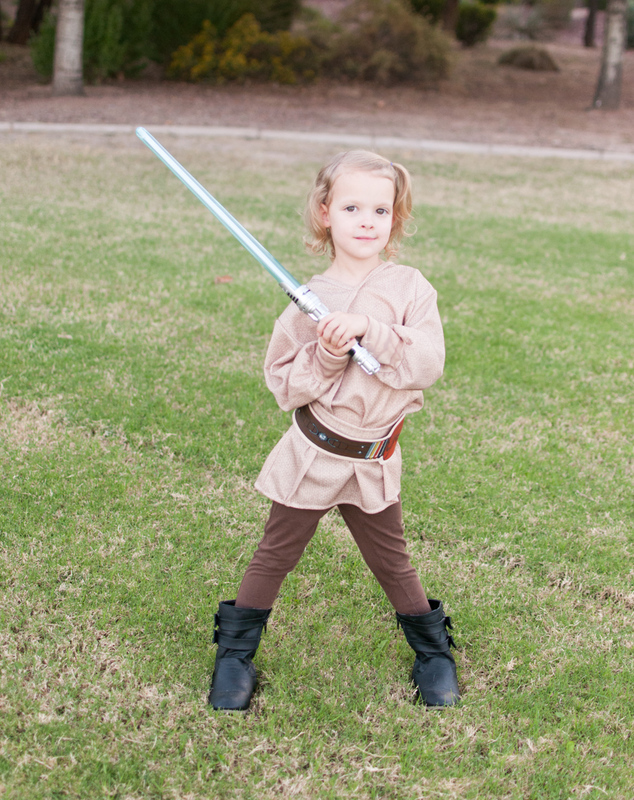 Clearly, we also need some light-saber training. These kids don’t realize they are holding blazing hot swords of light, right? Guess we need to watch the movies again. He came up with this pose himself! 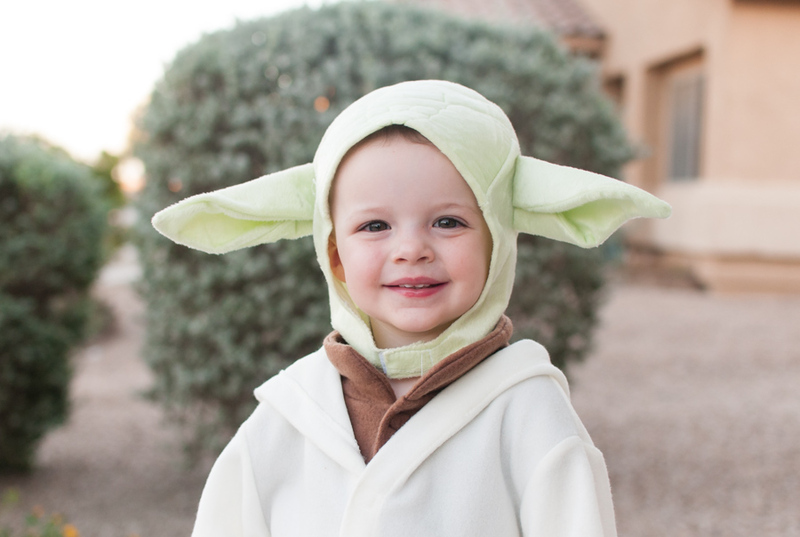 Then, the cutest little Yoda! 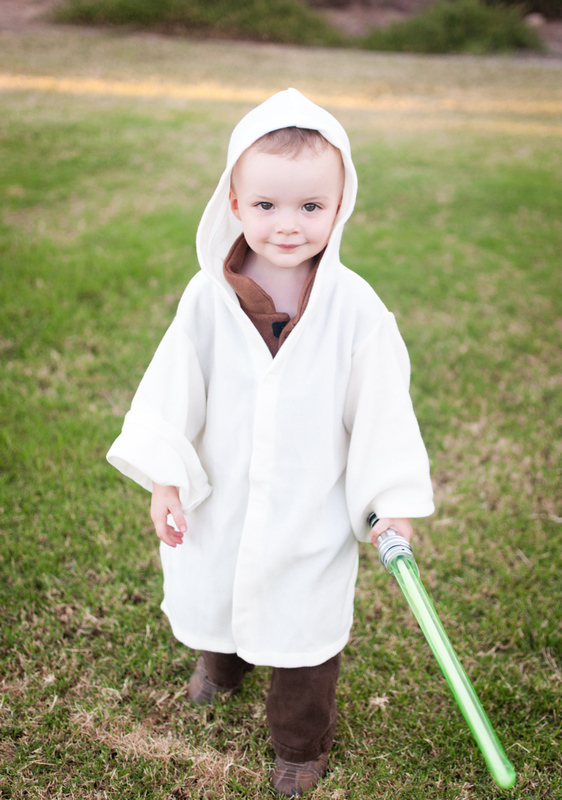 He actually loved wearing his ears and costume, which was a surprise for me. In general he totally “got” Halloween this year, for the first time ever. It’s so fun to see it click in a two-year-old that if he held up his bucket, they would give him chocolate. 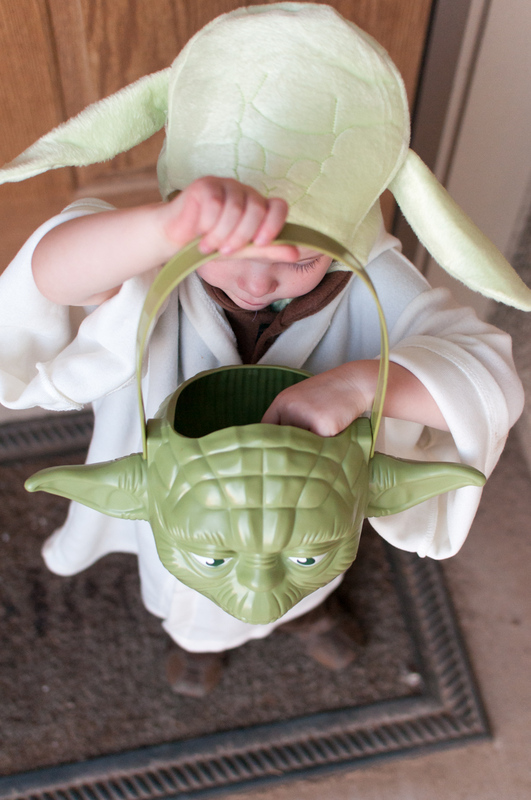 It was the CUTEST to see him trick or treat from house to house – he dutifully carried up his Yoda bucket to every door, and held it up expectantly for candy. 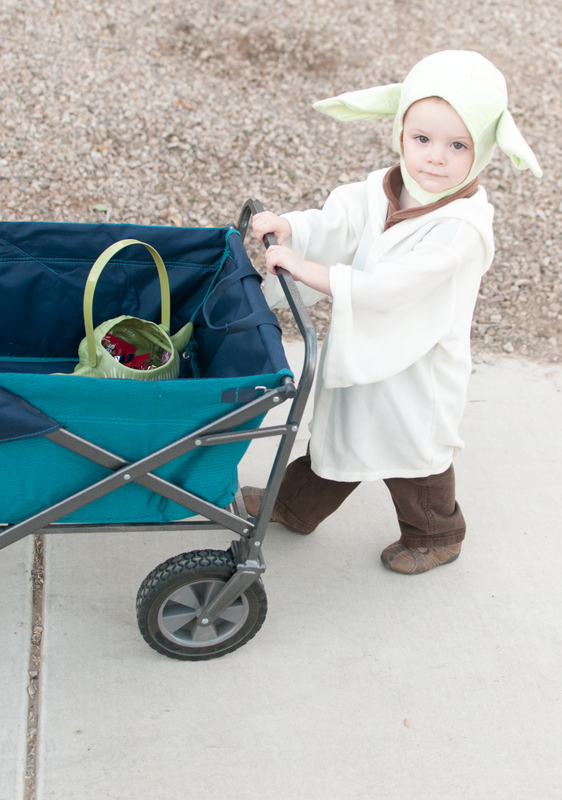 Then he called out “Bye!” to every house as he ran back to the wagon, where he carefully stored his candy and then pushed the wagon from house to house. 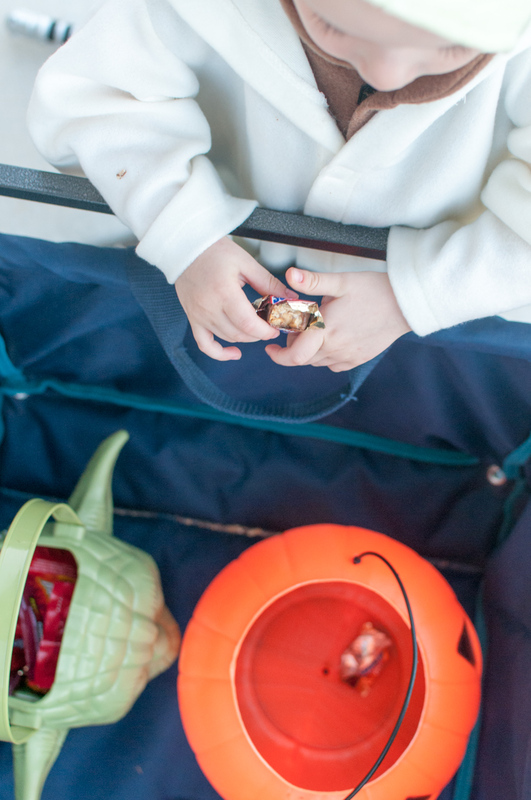 He refused to let us hold his candy or his hand… he just wanted to do it his way! 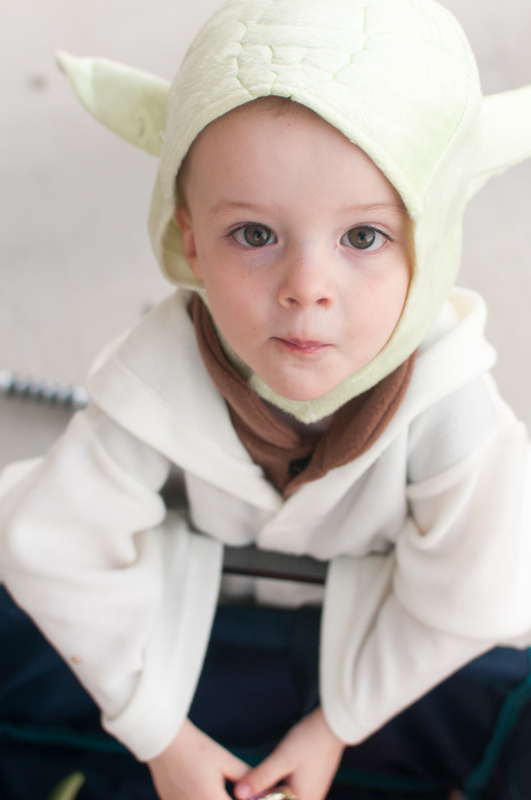 I love my little Yoda! 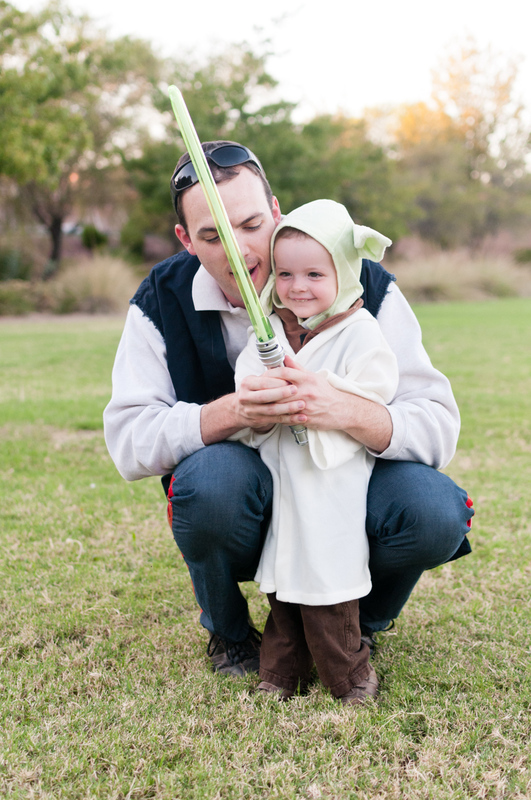 I told my kids that Dad would be Han Solo, and I would be the person Han loved. 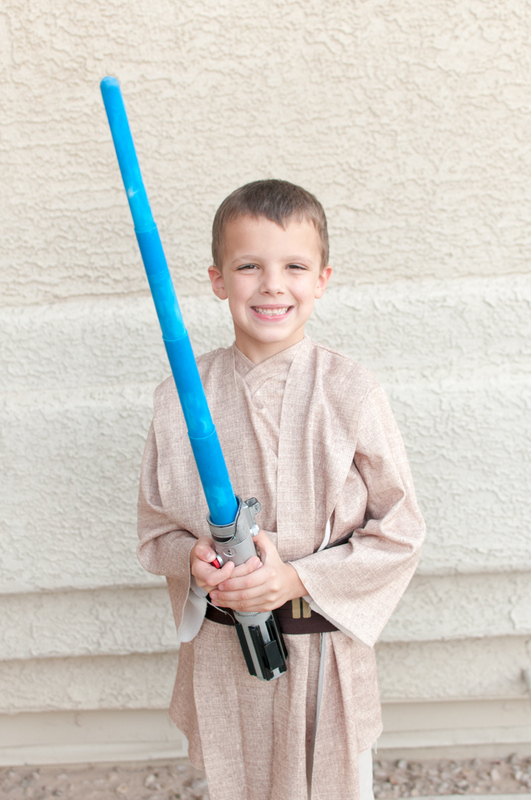 My six-year old grinned and said ” You’re going to be Chewbacca!? !” It was hilarious! 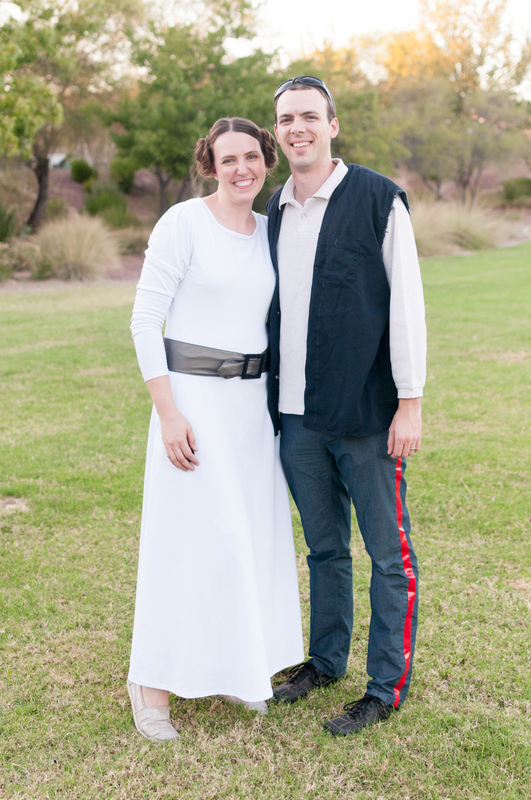 Despite his opinions about who Han loved, I chose to be Leia, which I pulled of with a simple white dress, wide belt, and classic buns. 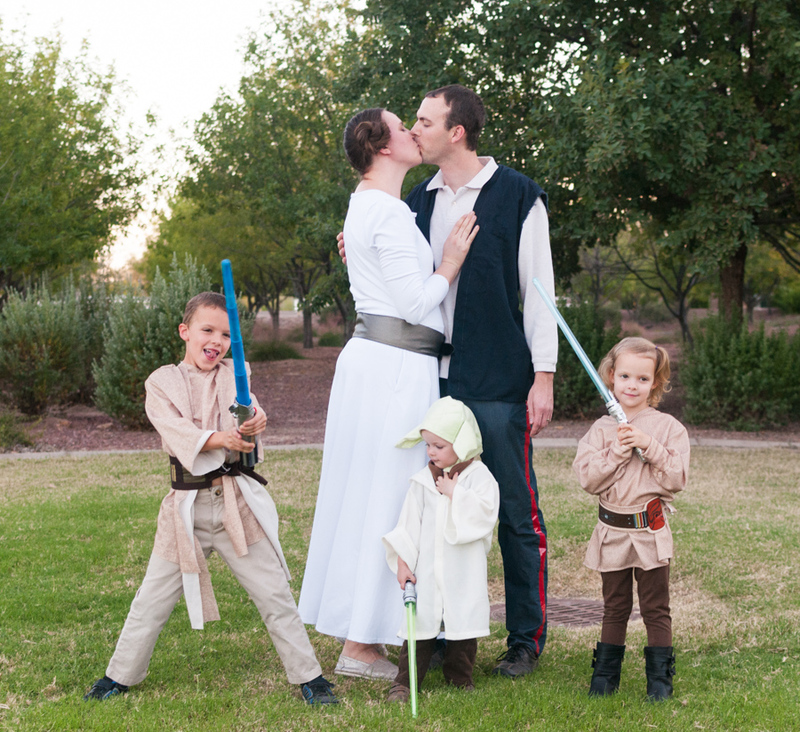 My husband was Han Solo, which was a fairly simple DIY. I used red duct tape that I tore down the middle length-wise to add a stripe to his pants. I found a black button up at Goodwill that I used for a quick vest: I cut the sleeves off, folded under the collar, and sewed the edges in a few inches to hide the buttons and make it look more like a vest. We could have added a holster and gun if we had them, but this was about the extent that you can expect from my Halloween-hating husband. I thought he pulled if off pretty well! 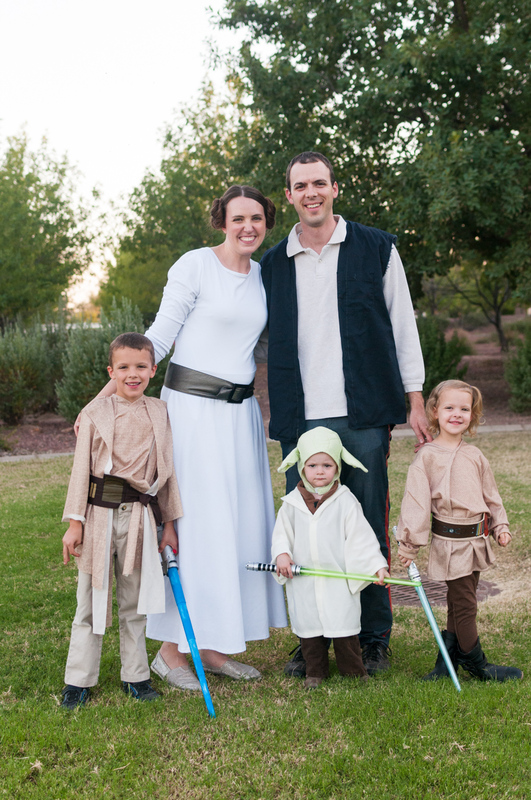 So, my from family to yours, Happy Halloween! COMMENT: Which picture is your favorite? 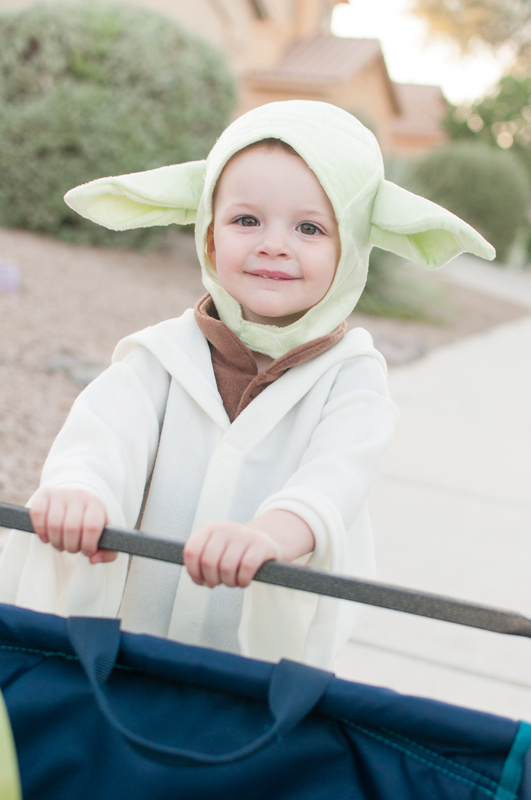 I know there are a tons of pictures of Yoda here… he was just so cute! 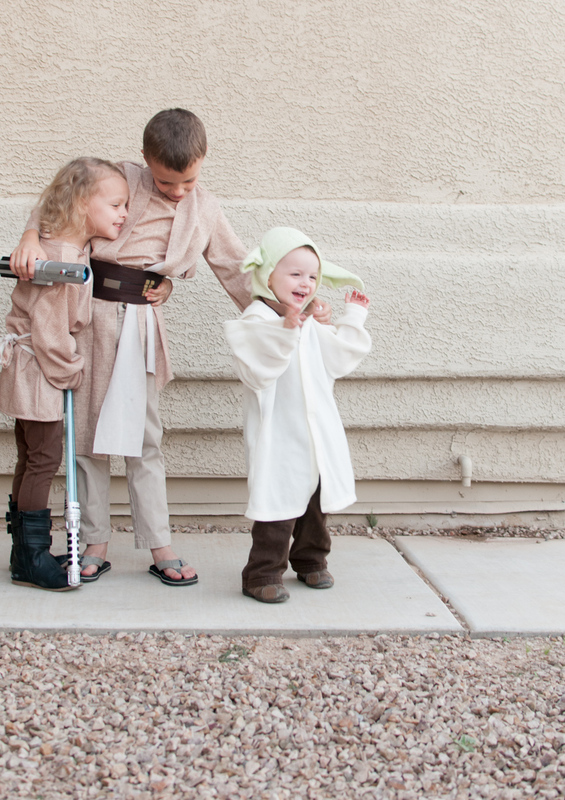 I’m partial to the one of Han and Leia smooching with some oblivious Jedi, as well as the last pic of my cute kiddos.